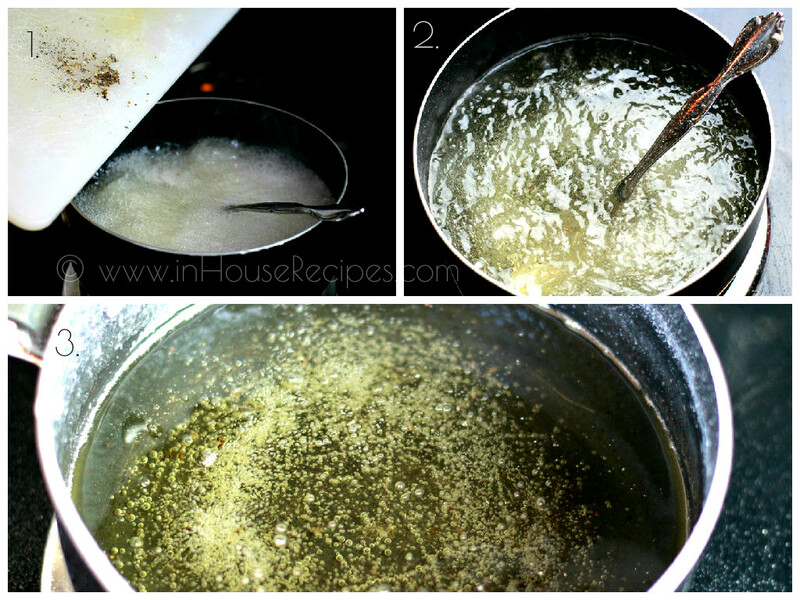 Sugar Syrup is commonly known as Chashni in Hindi. It is a thick liquid made with a mixture of sugar and water. 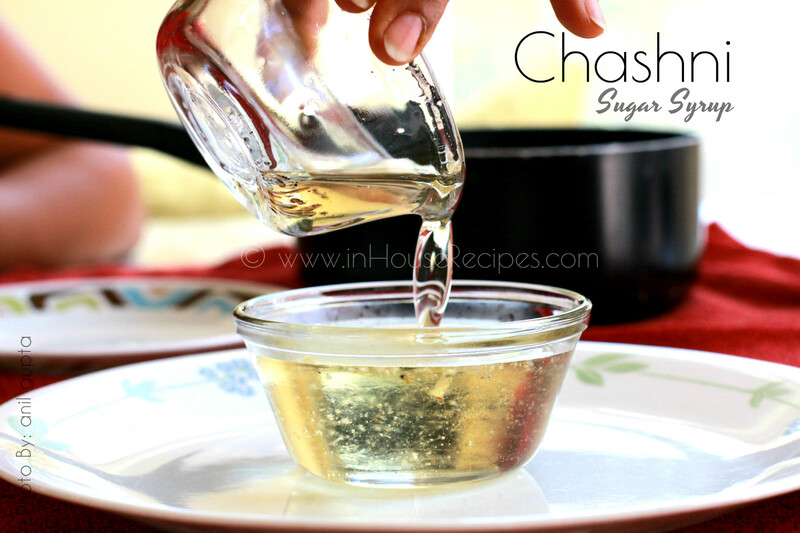 Hence, Chashni meaning in english is Sugar Syrup. Commonly used for dipping Indian subcontinent sweets like Gulab Jamun, Jalebi, Malpua . 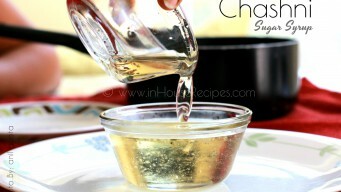 Chashni is also known by various other names liquid syrup, sugar water and many more in different regions. 'Chashni' word is more prominently used in north India and hence we have used this name for this article. How to make sugar syrup thick: Generally there are two levels of thickness in sugar syrup measured by its strings (1 taar or 2 taar). 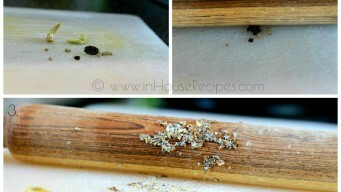 We have shown the Indian style way of checking the consistency (or thickness) in the recipe below. We are making a one string thick sugar syrup. The other one i.e. 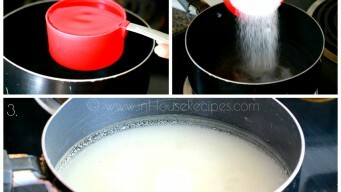 2 string thick can be made by increasing the thickness of the syrup by cooking it for longer time. This recipe will answer your question of how to make chasni for gulab jamun. Gulab jamun also needs one string Chashni. We are adding Cardamom to add a bit of flavor. Some people also like to add rose water. Using Cardamom is optional. We recommend using it. Peel the Cardamom to bring out the seeds. Crush or grind using a grinder seeds to make a powder. 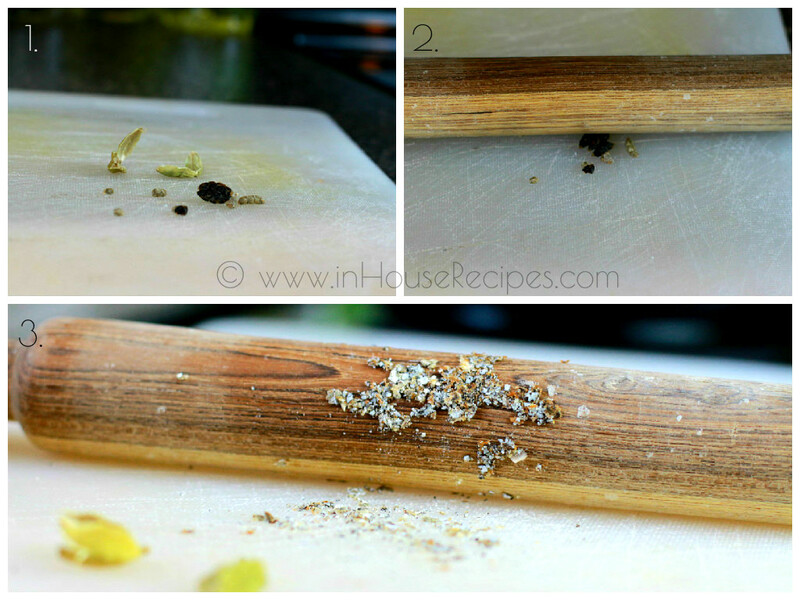 We used the rolling pin Belan to do it. Its fast and easier than grinding small quantity. If you have the ready-made Cardamom powder, you can skip this step. 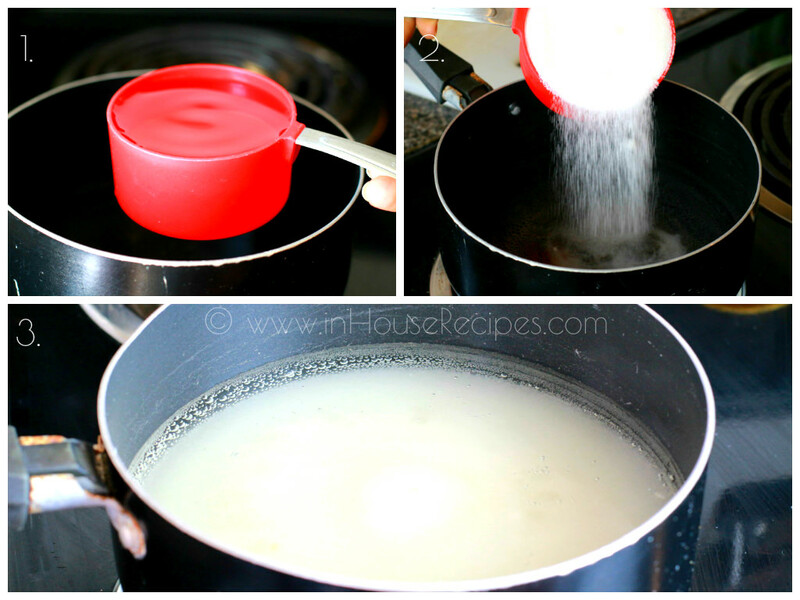 Take a pan big enough to hold the water and sugar together. Switch on the stove on high flame. Add Water and Sugar. Mix well and bring it to a boil. Once it starts boiling, add cardamom powder. Now we need to cook it on low flame until it becomes a 1 string Sugar syrup. After 20 minutes of cooking on low flame, our 1 string Sugar syrup should be ready. 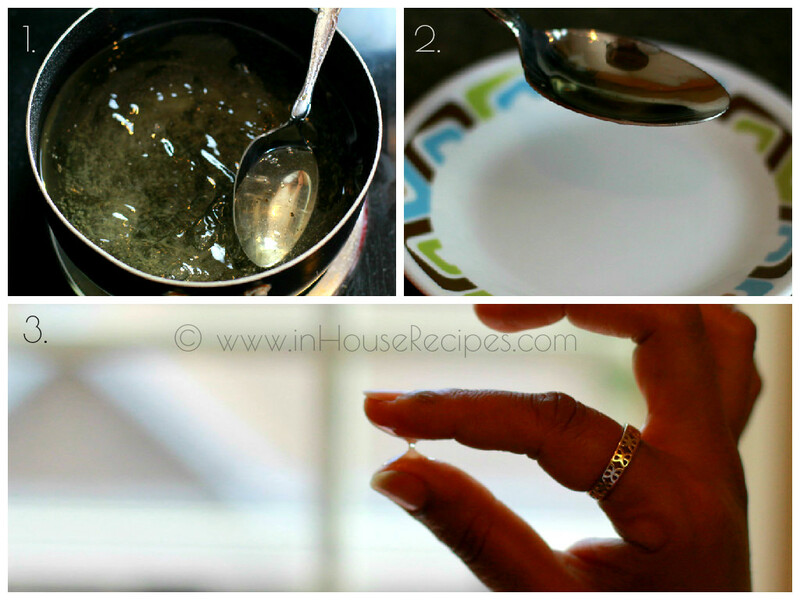 Take 2 drops of syrup between your index finger and thumb. 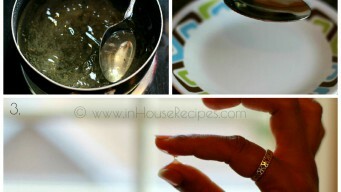 Open the index finger and thumb opposite to each other and you will see a string of syrup coming up. The string’s thickness will define its 1 or 2 string consistency. If the string is too light, it won’t make any string at all.If it is showing up 1 string, then it is called 1 string consistent Sugar syrup. If it shows up 2 strings, then it would be called as 2 string consistent Sugar syrup. You will be able to see the string within your fingers. 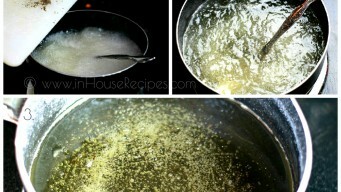 If you want 2 string Sugar syrup than cook it for another 5 minutes. Than check again with the same method. Sugar Syrup is ready. You can use it in any recipe of your choice. Chashni can be preserved in refrigerator for 10-12 days. You can re-heat it before using as an ingredient in any other recipe. Using a stove and heating for 3 minutes on high flame before using is the best method.If you are in hurry or do not have stove, use Microwave. You can check out our collection of tried and tested recipes to find out the sweets where you can use this chashni.